Polls show the country divided about the legacy of outgoing President Barack Obama. While he is popular with minorities and Democrats, the military mostly disapproves of him, and most Americans believe their lives haven’t improved during his presidency. “Democrats are exceptionally positive and Republicans are extremely negative” towards the Obama presidency, according to AP, which conducted the just-published poll with NORC at the University of Chicago. Obama leaves office with a 57 percent favorability rating, comparable to Bill Clinton in 2001. More than half the respondents, 52 percent, called him a “great” or “good” president. However, while 46 of respondents said the country as a whole was much better off (19 percent) or somewhat better off (27 percent) than it was in 2008, one in five did not see much of a difference, and 33 percent believed the US was much (16 percent) or somewhat (17 percent) worse off today. Those who believed the US was more divided after Obama’s presidency (44 percent total) outnumbered those who thought the outgoing president united the country (27 percent), while another 28 percent were neutral on the subject. Most respondents said Obama either kept the promises he made when he ran for office (32 percent), or tried and failed (44 percent), with only 22 percent insisting he failed entirely. The nationwide poll of 1,017 adults was conducted December 14-19, 2016, with self-identified Democrats outnumbering Republicans by 12 percentage points. The US military is apparently far more critical of their commander-in-chief, with only 36.4 percent approving of Obama’s performance, according to a poll by Military Times and the Institute for Veterans and Military Families at Syracuse University. Donald Trump won almost 49 percent of the military vote in November, while Hillary Clinton received 29 percent. Obama received very unfavorable (29.1 percent) or somewhat unfavorable (22.4 percent) ratings from a combined total of 51.5 percent of respondents. His approval rating was the highest in the Navy (43.4 percent), and the lowest among the Marines (26.4 percent). 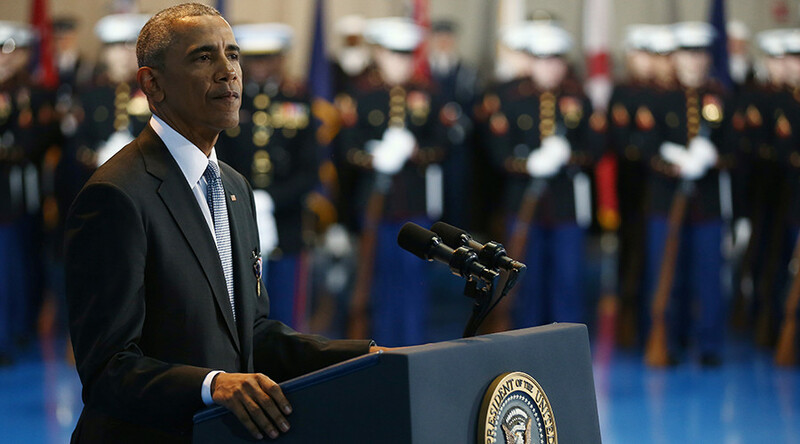 Obama was also more popular among the officers (43.9 percent) than among the enlisted (36.4 percent). Two thirds of the troops named budget fights and the sequestration as having a very negative effect on military morale. Of Obama’s social policies, only the repeal of “Don’t ask, don’t tell” ban on gay service members was judged beneficial to military readiness, while integration of women and allowing transgendered individuals to serve were overwhelmingly deemed harmful. Most of the troops cited Islamic State (IS, formerly ISIS/ISIL), Al-Qaeda and domestic Islamic terrorists as significant threats to the US. The overwhelming majority, 83 percent, wants the US to focus its power at home. The Military Times-IVMF poll was conducted December 16-21, 2016 among 1,664 active-duty troops.